Trust is the foundation of leadership. Without trust, it’s nearly impossible to recruit and retain followers and to implement change. Trust affects a leader’s impact and the company’s bottom line more than any other factor. When people experience your character, they will trust you. When you consistently do the right thing whether you feel like it or not, when your actions match your words, when you stand behind your team in every situation, you give people evidence of your character. The task of a trusted leader is to create an environment where others can do great things in safety, and character makes that possible. When people can count on you, they will trust you. Can people rely on you? Are you consistent and dependable? A trusted leader is one who can be counted on to keep their word and say what they mean, no matter the circumstances. When people see you genuinely care, they will trust you. If you want to build trust, demonstrate care for others—not just with lip service or in a time of particular need, but with genuine heartfelt compassion every day. Trusted leaders love people; they value connection and seeing others succeed. When people view you as competent, they will trust you. It’s important that you know what you’re doing—and when you don’t know something, that you have the fortitude to admit it. Trusted leaders work to keep advancing their skills and give others the resources to do the same. When people encounter your courage, they will trust you. Building trust requires the willingness to take risks and make hard decisions. Trusted leaders are courageous, and they inspire others to be courageous as well. When people know what you’re thinking, they will trust you. If you operate with transparency and full disclosure, no one has to rely on guesswork to know what’s happening, and there’s no room for a debilitating rumor mill to take hold. Trusted leaders communicate frequently, honestly and candidly, working to make sure their team stays informed. When people see you act with consistency, they will trust you. If you’re consistent in everything you do, you show that you hold even the little things to be important. Consistency at every level makes for greater trust and better results. Great leaders are consistent in all that they do. As a leader, you are trusted to exactly the degree that people believe in your character, competence, courage, candor, consistency and commitment. When people trust you, they’ll do almost anything under the sun not to disappoint you. Lead from within: The best leaders know that trust cannot be built overnight but requires time, effort, diligence and genuine character. The post How the Best Leaders Build Trust appeared first on Lolly Daskal. Trust is the most valuable asset and the most precious resource. It allows for vulnerability and honesty. When there is trust, it will affect every area of your life, business and personal. When there is no trust, it affects you, hurts you and ends up costing you. Trust usually takes years to build, seconds to break, and forever to repair. If you want to succeed, you need to be concerned with cultivating trust and credibility. Here are 99 ways to do that. 1. Lead by example. Your strongest testimonial is your own personal example. You must first and foremost lead yourself and show behaviors of trust–only then can others rely on you. 3. Show commitment. When you honor what you say, people will trust you. If you cannot keep a commitment, be open and honest about the reason and try to find a way to make it up to the other party. 4. Share your character. People will be more likely to trust you when they know your convictions. 5. Follow through on your promises. Keeping your promises lets people know they can count on you. 6. Manage complexity. Take time to explore issues that might be too narrowly defined. Always make what is complicated simple. 7. Have integrity. Integrity is doing the right thing even though no one is watching. Integrity is making sure that what you say and what you do are aligned. 8. Clarify expectations. State what you expect from others clearly. Research shows that 80 percent of conflict arises from unclear expectations. 9. Be competent. The difference between competence and incompetence is demonstrated in actions. Work constantly on improving your skills so you can stay on top of your game. 10. Find common ground. Even in an adversarial relationship, if you can find a little common ground you’ll have something to build on. 11. Be authentic. To be authentic is a daily practice of letting go of who you think you’re supposed to be and embracing who you are. If you can find the authentic part of yourself and embrace it, others will follow suit. 12. Eliminate ambiguity. Ambiguity is the enemy of trust. Uncertainty and mystery breed distrust. 13. Know yourself. Always operate with self-awareness and integrity. 14. Care for people around you. People trust those who demonstrate caring toward others. 15. Do the right thing. Let people see you doing what is right. It’s better to lose and do the right thing than to win and do the wrong thing. 16. Learn by listening. To be trusted, make time to learn from others. Listening is the stepping stone to learning. 17. Keep perspective. Put important things first and keep perspective. Most of what we hear is opinion and perspective, not facts and absolute truth. Keep that distinction in mind to build credibility. 18. Act in the best interest of others. When people believe you are truly acting in their best interest, they tend to trust you. 19. Live by strengths. Strength lives in difference, not in similarities. Showcase your strength to build trust. 20. Cultivate confidence. Confidence is the ability to feel certain when times are uncertain. Trust begins when a person has confidence; it earns credibility and offers assurance. 21. Don’t gossip. Do not gossip. Period. Do not talk about others behind their backs, ever! There is nothing good about gossiping, and nothing kills your credibility and integrity faster. 22. Take ownership. When you take ownership of your mistakes and learn from them, you prove that you can be trusted. 23. Be yourself. As the old saying goes, everyone else is already taken. Don’t change who you are to please other people–because at the end of the day, to earn trust is to be yourself. 24. Be curious. Resist taking over conversation or trying to immediately solve the issue. Stay curious and ask questions. Curiosity is the compass that leads us to closer connections. 25. Be straightforward. People do not like or trust people who play games. Be direct and straightforward and you will gain credibility. 26. Praise people. Create opportunities to praise people. People trust those who recognize them and appreciate them. 27. Guard your reputation. It takes many trusted actions and good deeds to build a good reputation and only one bad choice or action to lose trust. 28. Keep secrets. If someone tells you something in confidence, keep it to yourself. Knowing how to keep secrets lets others know they can trust you. 29. Stand for something. Know what you stand for and live by those principles. 30. Be accessible. People who are not accessible seem less trustworthy to others. 31. Model the behavior you expect from others. If you want to see trust from others, you have to first model it yourself. 32. Remember names. People like it when you know their names–it shows attention and caring and leads to trust. 33. Don’t interrupt. When you interrupt, you are telling everyone that what you have to say is more important than what anyone else has to say. Listen instead. 34. Don’t fidget. Be aware of your body movements. Minimize leg shakes, body shifts, and hand fidgets. It’s harder to trust someone who seems nervous or anxious. 35. Express your feelings. People who convey only hard facts come across as cold and distant. This does not encourage trust. 36. Vulnerability is the new strength. Trust builds when you open up. Don’t hide your human side–that’s the side that people connect to. 37. Look people in the eye. If you’re constantly shifting your eyes, it makes people suspicious of you. 38. Underpromise. So you can overdeliver. 39. Be consistent. Don’t keep changing your opinions or views. Consistency builds trust. 40. Bring out the best in others. Make people important to you and be interested in what they can accomplish. 41. Remove distractions. Focused attention earns trust, so turn off your phone, close your computer, and do all that you can to give your undivided attention. 42. Value accountability. It is not only what we do but also what we do not do for which we are accountable. When we accept accountability we are taking responsibility for our actions. 43. Don’t be late. Honor time–your own and that of others. It shows you respect them, and respect leads to trust. 44. Value differences. Trust is based in differences and seeing things in new ways. 45. Show empathy. Empathy must precede advice if people are to trust you. 46. Be understanding. Seek first to understand, and then to be understood. 47. Acknowledge other people’s efforts. If people are making an effort, make the effort to acknowledge them. 48. Be relevant. Showcase your capabilities and constantly improve on your skill set. 49. Be honest. Honesty really is always the best policy. 50. Be open-minded. Foster a climate in which people will share their ideas and be open to each other. 51. Celebrate diversity. Diversity is Different Individuals Valuing Each other Regardless of Skin and Intellect, Talent, or Years. 52. Be tolerant. People will be more likely to tolerant you when they know you are willing to be tolerant toward them. 53. Don’t take people for granted. Letting people know you value them is the foundation of trust. 54. Take your time. Take time when making decisions and think before acting too quickly. 55. Share information. Don’t hoard information but share it readily. Sharing earns credibility. 56. Don’t lie. One small lie can destroy all trust. 57. Be emotionally intelligent. Acknowledge feelings and show empathy. People will trust you more when they feel that you understand them. 58. Communicate effectively. Concise clear communication is the cornerstone for great trust. 59. Don’t cover up bad news. Tell people what they need to hear and don’t cover it up. You will earn trust even if the news is bad. 60. Add value. Work on adding value for others to all that you do. 61. Take responsibility. When something goes wrong, take responsibly and own your mistakes. We trust people who are responsible. 62. Good intentions go a long way. Even if things don’t go as planned, working from high ideals puts you in a good light. 63. Respect others. Treat everyone with respect–especially those who cannot do anything for you. 64. Perform small acts of kindness. No act of kindness, however small, is ever wasted. Even if no one else sees it, it will change your own heart. 65. Focus on delivering. You don’t get results by focusing on results; you get results by focusing on the actions that produce results. 66. Be congruent. Congruency between what you say and what you do is the key to a trusting relationship. 67. Inspire confidence in others. It’s said there are two ways of spreading confidence–one is to inspire confidence, and the other is to reflect it. Either way, it will earn you trust. 68. Speak from the heart. Always speak from the heart. It is the words that are spoken genuinely that earn you trust. 69. Be an active listener. The person who knows how to listen is the person who will always be trusted. 70. Don’t abuse privileges. Build trust by embracing your privileges with gratitude and a willingness to share, not by not abusing them. 71. Remove irregularities. When behavior is regular it creates stability. Irregularities create distrust. 72. Give feedback. Feedback is a gift, although we don’t often think of it that way. Learners need feedback more than they need endless teaching. Model your own openness to feedback. 73. Give credit. Don’t take all the credit for yourself. The more credit you give to others, the more trust they will give to you. 74. Admit mistakes. Let people know you are not perfect and you mess up from time to time. You are human. 75. Be transparent. Truth never damages a relationship if the motivation of transparency is to be candid and the truth is expressed in kindness. 76. Accept criticism. You must be well prepared to take on criticism and learn to improve; those who listen and learn are more credible. 77. Give without being asked. Most people keep score–I give x, so I should get y. To earn trust, you have to give without being asked. 78. Be genuine. Genuine people do not come around very often; when they do you, can trust them. 79. Trust your gut. If you feel something is wrong, trust that feeling. People trust those who trust themselves. 80. Don’t be disloyal. Being disloyal is one of the best ways to demonstrate that you are not trustworthy. 81. Make people matter more. Value long-term relationships more than short-term success. 82. Remove any masks. When you don’t have to wear a mask, you can honestly be true to yourself. 83. Be capable. Because capable people are credible, they inspire trust. 84. Make a difference. Trust matters when you are trying to make a difference. 85. Avoid the gap. Without trust there is a huge gap. Take any action you can, small or large, to close it. 86. Help people whenever you can. If you want to build trust, be of service to others. When you serve, you earn trust. 87. Don’t blame others. When things go wrong, the last thing you want to do is point fingers. People will be watching you, and they will trust you when you take ownership. 88. Give compliments. Be generous with your compliments, and be specific. 89. Don’t try to be perfect. There is no such thing as perfect. Be human, because perfect doesn’t exist and trying to be perfect usually comes across as fishy. 90. Be a friend. Treat everyone with the same love and care you would give your best friend. 91. Be fair. Treat people fairly, always. 92. Do everything with excellence. Never compromise on your work or words. Do everything with excellence and let people know you live by high standards. 94. Make trust a daily habit. Build trust by making a daily habit of trusting and being trustworthy. 95. Get personal. One way to build trust is to encourage your team members to see their colleagues as people. Think about creating situations that help them share personal stories and bond. 96. Go above and beyond the call of duty. Going the extra mile is a great strategy for building trust. 97. Discourage clichés. Avoid them–they can undermine trust. 98. Value long-term relationships, not short-term connections. Trust is built on fostering strong caring relationships. 99. See beyond yourself. The most trusted people see beyond themselves. They help others see beyond the visible. They think of the unthinkable and take you there with them. The post 99 Simple Things That Will Help You Build Trust and Credibility appeared first on Lolly Daskal. How many times in your life have you wanted to achieve something significant but were stopped by an inner voice? How many times in your leadership have you wanted to move to the next level but heard something inside saying, “No, you’re not ready”? These voice—the one that tells you you’re not good enough, smart enough, capable enough, worthy enough, or ready for the next step—is the voice of the imposter within you. The imposter wants to hold you back and prevent you from doing the things you dream about. It’s sabotaging you in the guise of protecting you. The imposter compares. Most of us spend too much time looking over our shoulder to see how successful, how accomplished, how smart someone else is and how we measure up. There will always be someone who appears to be smarter, better, faster, wiser, leaner than you are. It can be exhausting trying to keep up with everyone, and comparing yourself to others leads to nothing but frustration. Measure your accomplishments within yourself. Don’t look at others but ask yourself daily what you can do better tomorrow. The imposter wants to please everyone. When you feel insufficient it’s a short leap to wanting to always please everyone, even though you know it’s impossible. Trying to please all is a no-win situation; leadership is not about pleasing people but empowering them—and that means sometimes pushing them to the edge of their discomfort zone. If you’re trying to please everyone you are doing harm to your leadership. The imposter is an overachiever. When your to-do list that is longer than you can manage, you need to step back. Delegate to the gifted and talented people you’ve surrounded yourself with. When you do, you help keep your own workload manageable and you empower others to lead and grow. The imposter is a perfectionist. There are few things more unhealthy than an either-or system in which you’re either perfect or a failure. Perfection isn’t real, and the sooner a leader knows that the less they will feel like an imposter. Don’t reach for perfection but concentrate doing your best to the best of your ability in a way that shows people that what you do you take pride in. Remember that your actions send a message to those you lead. The imposter feels like a fraud. The saying “fake it till you make it” is certainly popular. But it can be a damaging message. Pretending to be something else while you’re trying to figure it out isn’t authentic or genuine. Don’t fight the imposter by pretending that you deserve your success—learn to believe it, and then let the rest fall into place. Lead from within. The imposter within you will try to sabotage you and play havoc with who you are and what you can accomplish. The only effective way to combat it is to take full charge of your capabilities and competence and lead with confidence, because greatness lies within you. 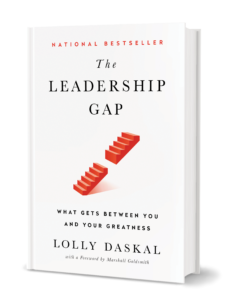 The post How the Imposter in You Can Derail Your Leadership appeared first on Lolly Daskal.